No, this isn't another smartphone screed. Yes, they're popular, but they're still not anywhere near winning over the enthusiast demand for more expensive, higher quality devices like DSLRs and mirrorless cameras. This is about a turning point in photography, and the relegation of one of its most popular formats into a purely niche product for pros. It's already begun. Digital SLR has become such a common acronym that most people confuse it for any camera that has interchangeable lenses. It's actually a very specific type of camera, with one very specific mechanism: the single lens reflex. That SLR mechanism dates back almost a century, and it has dictated many iconic camera attributes such as size, shape, and some aspects of performance. The SLR accounts for what you see when you look through your camera's viewfinder. When light enters through the camera's lens, it strikes a little reflex mirror that bounces it up into a prism, then onto ground glass, which is what you look at when you bring the camera up to your eye. When you finally press the shutter button, the mirror swings out of the way so that the light can strike the digital sensor (or film) that sits behind it. That's where the single lens part comes in; it merely distinguishes SLRs from older twin-lens reflex cameras, which feature an entirely separate lens solely for delivering light to a viewfinder. The SLR became popular simply because it was the best way to frame your shots—letting you see exactly what the lens saw. This was only possible by physically bouncing the light from the lens into your eye, by way of the reflex mirror. In the last couple of years a new type of camera has appeared, one that has interchangeable lenses but ditches the SLR part. These have come to be known as mirrorless cameras (for want of a snappier name). They include the Sony NEX, Olympus PEN, and FujiFilm X cameras, among others. In place of the SLR, these devices make use of a large LCD you hold away from your face, and/or a tiny LCD you hold up to your eye—the electronic viewfinder. Many enthusiasts love the compact sizes and throwback feel of mirrorless cameras, but they haven't yet found broad appeal. They're too unfamiliar and they can seem expensive to a marketplace that equates "quality" with "big and bulky." Simply put, DSLRs look more professional. They let the world know that you are doing Serious Photography. But despite the sluggish dissemination of mirrorless cameras, changes in technology are taking place that will threaten the dominance of the DSLR with brute force, whether the public even knows it or not. Electronic viewfinders are starting to rival or exceed the quality of experience in optical viewfinders. Where EVFs were once pixelated and laggy, they are now big, bright, and accurate. Using a great EVF means having access to features just not possible on a DSLR. Being able to preview exactly how your photo will be exposed before pressing the shutter is invaluable. Manual focus aids like image magnification and peaking, where edges of in-focus objects are highlighted, make it easier to use vintage lenses successfully. Focus systems are also evolving rapidly. The reigning champ of focus systems, phase-detection, was once dependent on a reflex mirror to bounce light into a separate sensor in charge of calculating focus. Now, on-sensor phase detection is replacing the need for mirrors, and contrast-detection auto focus is improving as well. 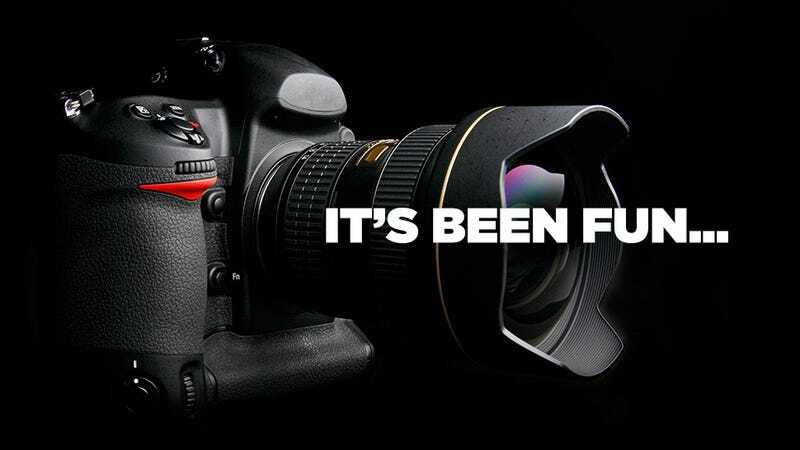 The result is a new breed of high-performance interchangeable lens cameras that are smaller, lighter, and more durable. The final step for mirrorless hegemony is tackling the high end. Sony will soon ship its milestone A7 series, two compact mirrorless bodies with full-frame sensors, the lynchpin of top-tier camera bodies and the harbingers of the DSLR's doom. They are, simply put, the best of both worlds. The 24-megapixel A7 and the 36-megapixel A7r feature these high-performance sensors, eliminating the gap in image quality between mirrorless cams and pro DSLRs. The A7 series is priced at $1700 and $2300 respectively (body-only). That's on par with entry-level full-frame DSLRs like the Nikon D600 and Canon 6D. But what you get in return are cameras that are much easier to carry around and that are less intimidating to subjects, while not sacrificing anything when it comes to the ability capture pristine images. They aren't anywhere near perfect cameras, but they are different cameras. More and more manufacturers are throwing their weight behind mirrorless cameras, but it's the big guys, Canon and Nikon, playing catch-up. That makes sense; they profit heavily from DSLR sales, and have failed to capitalize on the turning of the tide. Both brands have introduced limited mirrorless offerings that have failed to live up to the competition from the likes of Sony, Olympus, Panasonic, and Fujifilm. It's a sign that they are unwilling to invest heavily in this new product category, hoping the storm will pass. Nikon just announced the Df, a slightly smaller full-frame DSLR that borrows the retro stylings of the most popular mirrorless cameras, but is stubbornly conservative in its insistence on retaining the mirror and pentaprism. DSLRs aren't going to disappear entirely; they still reign supreme in areas like continuous autofocus, where tracking moving subjects requires the robustness of traditional phase-detection. And they still are better suited to carry humongous telephoto lenses. There will always be studio pros, sports photographers, and others, who have no concern for size and weight, who just want the most heavy-duty, reliable, speediest beast they can find. And they will soon make up the brunt of DSLR owners. But for most people, there's little reason to own one now. We have mirrorless cameras that can match or exceed the DSLR in user experience, image quality, and handling. Why strap an extra pound of glass and metal around your neck for no reason? Lighter and smaller means easier to have with you at all times, and for many shooters like myself who take pictures on the streets and while traveling, that is hugely important. Yes, DSLRs will continue to provide niche benefits. But when it comes to the vast majority of camera users, the hobbyists, amateurs, and first-timers, the moniker and mechanics that have been a mainstay of photography for decades—the single lens reflex—is likely to fade away.